“Sallu ki shaadi” is the most popular news in the media these days. And now the lead actress of movie Arshin Mehta gone mad in love with Salman Khan. She told to the media that she in love with Salmaan Khan and she wants to express her feelings in front of him. During the interaction with media she told that she never marries until and unless Salman khan does not meet her. During the interaction with media today she said, “she is biggest fan of Salmaan Khan & this movie is dedicated to him. 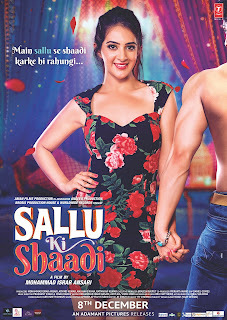 “Sallu ki shaadi” is her second film in which she playing as main lead, before this movie she played lead role in movie “The Really” released this year. Arshin Mehta also a very popular face in Modeling Industry, she did so many commercial ads for TV Channel. She played a small role as a reporter in the movie “Bajrangi Bhaijaan”. “when Israr ji, Director of Sallu Ki Shaadi offered for lead role in movie, i couldn’t believe and in a second i agreed because i don’t want to loose this opportunity”, she added. The trailer of “Sallu Ki Shaadi” is trolled in these days. The news of Sallu ki Shaadi is now most popular among the people as well as film industry. Now actress Arshin Mehta is waiting for that moment when reply come from salmaan khan’s side and she propose him. Except Arshin Mehta, Zeenat Amaan, Kiran Kumar, Sandeep Anand, Kashyap and Asrani are also playing main role in the movie. “Sallu Ki Shaadi” will release on 8th Dec. in all over India. The co-stars, Director Mohammad Israr Ansari and rest of the crew are very excited about the film.